I am more impressed by drummers with good "feel" - and in that list I would include Ringo, Keith Moon, John Bonham, Ginger Baker, and (believe it or not) Peter Criss. I am not so much a fan of technical flair, although I appreciate it. I like a good solid rock feel that is ahead of the beat, not behind it (ala Dennis Wilson). I don't think Ricky Fataar had the feel either. And for that matter, after listening to Anthology I, which contains Pete Best's version of Love Me Do, one can understand why the Beatles made the change too. There's just no "feel", especially when Best tries to shuffle in the middle eight/harmonica solo. Keith Moon is my absolute favorite. So much fun to listen to. So much stuff going on. He was fantastic, on and off the stage. Phil Collins is a superior drummer. I’m hoping he returns to the kit again for a Genesis reunion with Gabriel and Hackett in 2007. How would you rate Mick Fleetwood? Dave Grohl on Nirvana's Unplugged performance - Subtle and Elegant. Chester Thompson is the man. I'm one of the biggest Genesis fans you'll ever find and I love the drumming he did in their live shows between 1977 and 1992, but I really think that Chester's best work was during his time with Frank Zappa during 1973 and 1974. Listen to One Size Fits All and you'll hear what I mean. I believe Chester is teaching (Princeton maybe?) now. Such a terrific drummer. He also released a solo album in the early 90s called "A Joyful Noise" which is exactly that. A terrific album whose re-release on CD is long overdue. Al jackson Jr. from Booker T and the MG's.....unbelievable timekeeper!..also Ronnie Tutt. But for the most part my fave drummers are from the jazz world....there are so many Elvin Jones, Art Blakey, Billy Higgins to name a few. There's another name. Good one. He is a very, very good drummer. In command, and plays like a human metronome. Listen to "I'm So Afraid"
I am also with Bubba - Phil Collins, all goofing aside, is quiet solid, almost in a jazzy type sense. Buddy Rich !! !.and Gene Krupa and Sonny Payne from the new testament count basie band .listen to his drum work on Sinatra at the Sands....!!! Joseph "Zigaboo" Modeliste, from the Meter's one of the greatest drummers i have ever heard, also Jabbo Starks and Clyde Stubberfield from the JB's !! !.they invented the beat in Hip/hop rap !!! funky drummer ! 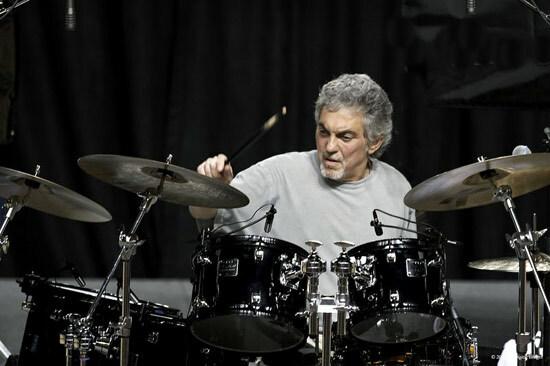 Why has no one mentioned Steve Gadd? You've got a Friend in me then.Genesis IS my all time Favorite band!! BB's a very close second. Genesis really lost something though after Steve Hackett left in 1977. Have you seen "The Musical Box",Genesis tribute band,on tour?? The guy that portrays Gabriel is un-believable!! You think you're actually watching Peter Gabriel circa 1973-75.And the sound!!! WOW,these boys got the early Genesis tone down pat!! Amen. As far as funk goes, I also love Greg Errico from Sly and the Family Stone. On a totally unrelated note, I don't think any thread on great feel drummers would be complete without a mention of Levon Helm. That man is a giant. And for pure rock fury while still being able to groove amazingly, I don't think you can beat The Stooges' Scott Asheton. All interesting comments. I used to play drums in a band myself for several years (not a successful one though!) - and started after finding there were much better guitarists at college than me but no drummers! Drumming to me is about what fits the music. The wrong good drummer in a band can sound awful - saw Roxy Music on the Flesh & Blood tour when Andy Newmark had replaced Paul Thompson. Newmark was fine on any of the new stuff, but totally wrong for any of the older songs - he was behind the beat all the time, and couldn't drive the band at all. Moon is my idol, but he would have been in trouble in almost any other band than The Who, as he was just perfectly suited to playing with Townshend (odd enough in itself, as the drummer normally plays with the bass player). The Who with Kenney Jones were flat - too grounded when they need to fly. Levon Helm is a wonder - one of the few that never plays what you expect him to but it still sounds just right. The more technical drummers like Phil Collins are fine with very busy music like Genesis, but there isn't a whole lot of heart there, unlike Bonham for instance who was flash but in a very down to earth way (i.e. it sounds basic but is actually unbelievably tricky when you break it down). Although Moon was my idol I couldn't play like him (who can?) and on the whole I went for a more basic Bonham - very heavy bass drum and snare, not too bothered about the whole paradiddle stuff. I do miss playing! Let's get to the point please -- Chollie Watts! Bernard Purdie.......no one has mentioned him , he even claims he did the drumming on some Beatle songs ?? Idris Muhammad his Power of soul album on CTI is a must have.........also Billy Cobham who is perhaps the Fusion drummer of the 70"s.
Along with Cobham as far as fusion goes would be Phil Collins when he was with Brand X.
I was just listening to the Unorthodox behaviour CD and WOW could Collins play a mean 12/8 timing on Nuclear Burn!! No one has mentioned Louie Bellson ....or Tony Williams !!!!! Matt Johnson who drummed on Jeff Buckley's "Grace." Meshuggah's drummer, Thomas Haake. Really innovative, this guy. Vinnie Paul. Almost too solid. And "In Utero" Dave Grohl. You wanna hear a hot new drummer? Check out the Rocking Scoundrels . . . Scroll down to the Jukebox and listen to "Sparks" . . . Darren Edwards is a chip off the old Moon. I'm into percussion in general . . . and rudimental / corps-style drumming is one of the coolest percussive art forms on the planet. Here's a piece I wrote in that style: Tremor in the Force. Two pages on rock drummers and no mention of Mitch Mitchell? I am sad. What do you all have against him? "How would you rate Mick Fleetwood?" I like his style. He is solid and does some tasty fills. But when I think of Mick Fleetwood I have to think of the rhythm section of John McVie and Mick Fleetwood. In my opinion, the are among the very best at what they do. Listen over the years to the Peter Green, Bob Welch, Danny Kirwin, and Lindsay Buckingham incarnations....the one constant is that bass/drum sound that these guys pull off as a unit.